RingCasting® is an automated voice broadcasting service. RingCasting® Voice Broadcast will dial a list of phone numbers and play a pre-recorded voice message to the recipient. The recipient has the choice to either accept or decline the message before it starts playing. If no one answers the phone, the message will be played into the voice mailbox. RingCasting® Voice Broadcast liberates you from manually dialing phone numbers, and verbally repeating the same message to your target recipient. RingCasting® Voice Broadcast automatically dials phone numbers and transmits thousands of voice messages per day. Spend less time on the arduous outbound calls. Expedite your outbound campaigns with unprecedented speed. With RingCasting® Voice Broadcast, you can make thousands of calls per day to your contact list. WHAT IS RINGCASTING USED FOR ? WHO CAN USE RINGCASTING® ? Any company wishing to maximize on their outbound phone calls can use RingCasting® Voice Broadcast. Companies that require delivery of a voice message to be consistent, precisely worded, and mass delivered will advance with RingCasting® Voice Broadcast. WHAT THE RINGCASTING® SYSTEM WILL DO FOR YOU ? WHAT IS THE SUCCESS RATE WITH RINGCASTING® ? RingCasting® Voice Broadcast is only a method of delivery. Your success rate will depend entirely on your message to the customer, your telephone list of the people you are calling, and the quality of your product or service. The RingCasting® Voice Broadcast service will expedite and multiply your existing success rate. RingCasting® Voice Broadcast will give you the advantage of speed over your competition. 1. How do you deliver a recorded message? 4. How many messages can you deliver? 6. What is the message delivery success rate? You can use your own client list. 9. What data fields must be in the contact list? 10. Do I get any output after the job is finished? Yes, you get a log report and an exception report for every job. 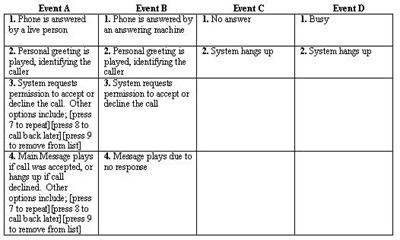 11. Who records the message? 12. What is the maximum length of the message? There is no maximum length; but we recommend 30 seconds. Additional time can be requested. 13. What does the message sound like after it's delivered? 14. Am I charged for every phone call regardless of the outcome? 15. How many retries do you make if the line is busy? As many retries as you request. 16. What are your call center hours of operation? Generally 7 a.m. to 11 p.m. EST, but we will accomodate your needs. 17. How should my message be structured? For RingCasting® Voice Broadcast, your message should have the following structure: Hello, it's Jim Parker from XYZ company, we have an important message for you, to accept press 1, to cancel press 2; -- Thank you for accepting, Our message is Blah, Blah, Blah, Blah, Blah, Thank you. Let us call all your contacts from previous shows for you, for less cost and time. When targeted individuals get a personal voicemail that gives them reason to look for and respond to your email or direct mail, you cut through clutter and get more results. Fast dissemination of information to your members or colleagues. RingCasting® Voice Broadcast has the ability to deliver a personalized offer related around a specific promotion or upcoming special event. Please ask about our Pollcast service regarding polling and surveys. Use RingCasting® Voice Broadcast for special events, speakers, sales, promotions, etc. to increase awareness and boost attendance.